If you know any Italians, one thing you would be sure to remember is that we are filled with so many traditions when it comes to food. We have a dish for just about any holiday on the calendar. For my family, it is the “Seven Fishes” on Christmas Eve, the Cavatelli for Christmas Day, the Ravioli on New Years Day, and for Easter we have Shadone. Shadone is a rather reclusive dish. If you Google it, you probably will not find much information on its source or on its history. Like all dishes in Italy, they are quite regional, so my guess is that it originated somewhere in Northern Italy, possibly the region of Liguria, as this is where eggs were used most in Italian cuisine. I would say it is more of an educated guess than fact though, so don’t hold me to that! Those of you more familiar with the Pizzagaina, may find it to be very similar to Shadone as well. I find it to be a cross between a Quiche, a pie, and a Calzone. The star of the dish is of course, centered on the symbol of Easter, the Egg! 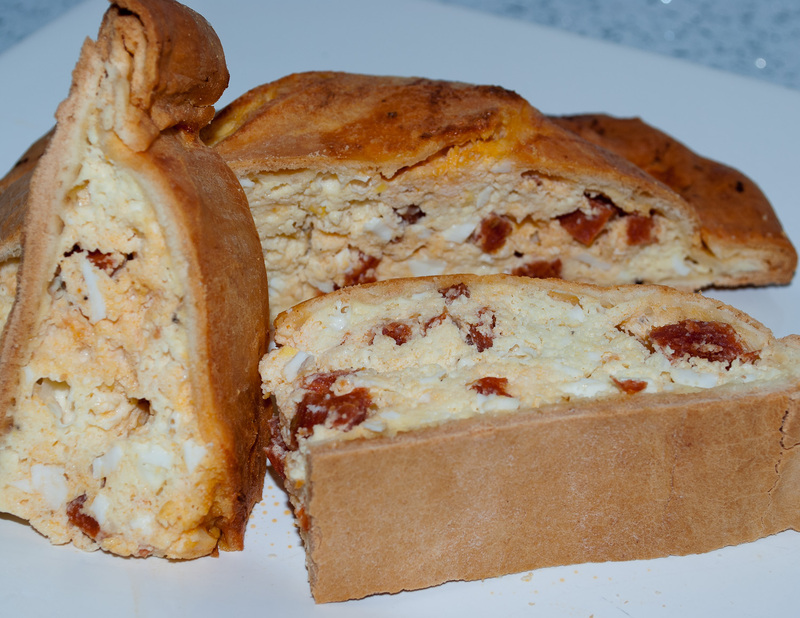 Shadone is a decadent Easter bread filled with plenty of eggs, cheeses, and pepperoni (salami). It is a bit involved to make, and it was a bit challenging for me as I have never made it before. I seemed to spend an unusual amount of time making my iPhone dirty by trying to call my father to get his tips and tricks! One of the things I loved about this was the smell. I remember smelling the aromas of the salami as it baked in the oven! There are few aromas better to my nose than pepperoni and bread baking in the oven! We generally would eat this as a starter before our Easter brunch. 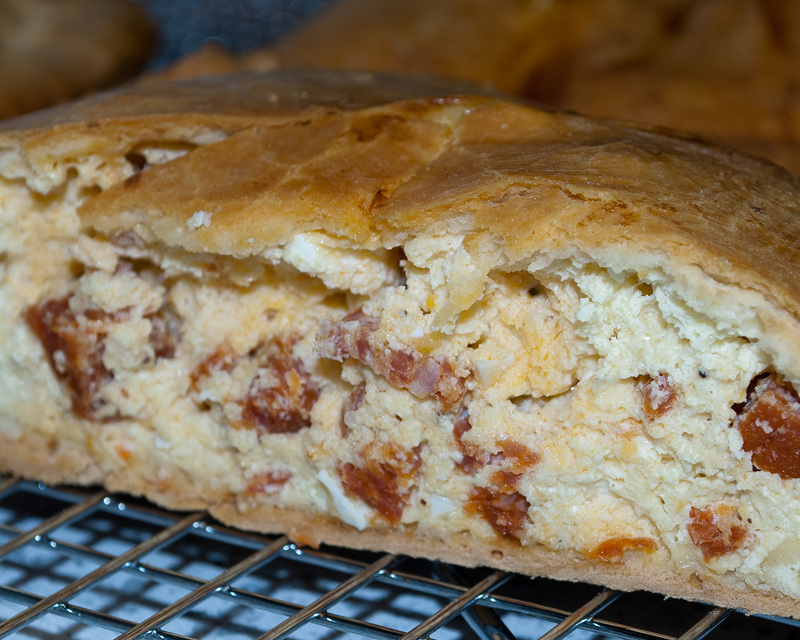 But it also makes a great breakfast, so grab a nice big slice and a cappuccino and enjoy! Buona Pasqua! Hard boil the eggs; Place the eggs in cold water in a medium saucepan, making sure they have about 1 inch of water covering them. Put about a teaspoon of salt in the water and heat the eggs on high heat to a boil. Once it comes to a boil, turn the heat to medium and continue to boil for 1 minute. After one minute, cover, and remove from the heat. Let sit for 12 minutes. Your eggs should be perfectly hard-boiled. Set aside to cool completely. Chop the salami into small cubes, I basically julienne the salami. Peel and chop the hard-boiled eggs. In a large mixing bowl combine the pepperoni, hard-boiled eggs, the cheeses. Add the lightly beaten eggs and mix well. Add some cracked black pepper and some salt. At this point I taste for seasoning, but if you are queasy about eating raw egg, you can skip this. I added about 1 teaspoon of salt and about 1 1/2 teaspoons of black pepper. 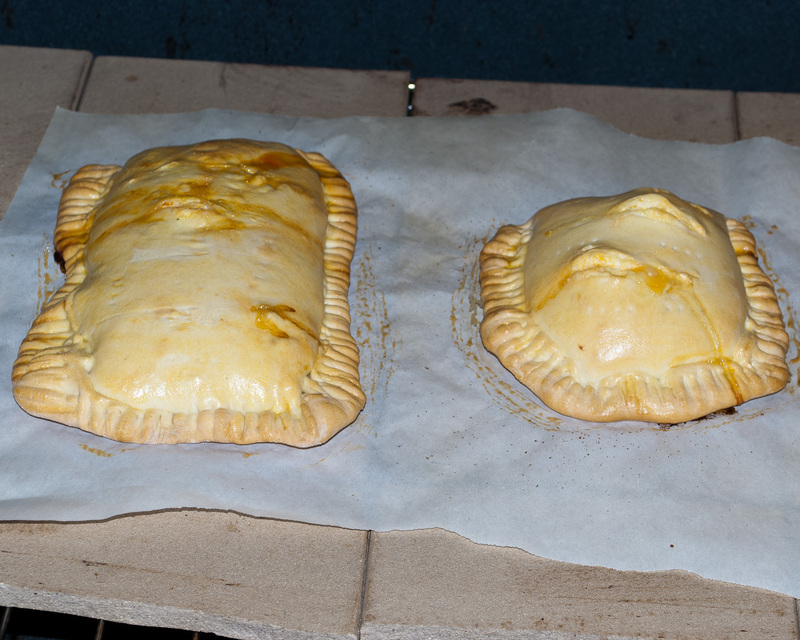 Once the filling is ready, you can cover with some plastic wrap and put it in the fridge while you work on the dough. For the dough, place the dry ingredients (flour, salt, baking powder) into your Kitchen Aid mixing bowl and use the paddle to mix for about 1 minute. At this point I placed my tiles in the oven on the bottom rack and preheated the oven to 350°F. Then detach the bowl and add the cold butter in chunks. Use a pastry blender and work the butter into the flour until the mixture becomes crumbly and you no longer pull butter out of the pastry blender. Attach the mixing bowl and switch to the dough hook. Whisk the eggs and the milk together in a separate bowl and add to the dry ingredients. Mix on low-speed for about 2 minutes. Now, I did something different here, instead of continuing to knead, I took the dough out, folded it a couple of times, then placed it back into the mixing bowl. I wanted to make sure that all the flour was incorporated into the dough. Turn the mixer back on low and knead for 8 minutes. Cover it in plastic wrap and let it rest for about 10 minutes on the counter. I took a portion of dough a bit larger than an orange, flattened it with my hands, dusted it with flour and fed it through my Kitchen Aid pasta roller on setting #1. I dusted it again with some flour and fed it through setting #2. I cut the sheet in a length about 24 inches, lay it down on a dusted countertop or pastry board. I rolled it along its width with a rolling-pin to make it a bit thinner and open it up a bit to about 8 inches. I cut the sheet in half (One for the bottom, one for the top) and placed about 1 cup of filling in the center of the bottom sheet, spread it out a bit with your spatula, but be sure to leave about an inch all the way around the sheet for you to close it up. Now place the top half of the sheet over the bottom sheet with the filling. Cut off any excess dough to even up the edges. Fold up the edges and corners, and seal with a fork in a cross-hatch pattern all around the pie (very similar to sealing ravioli). 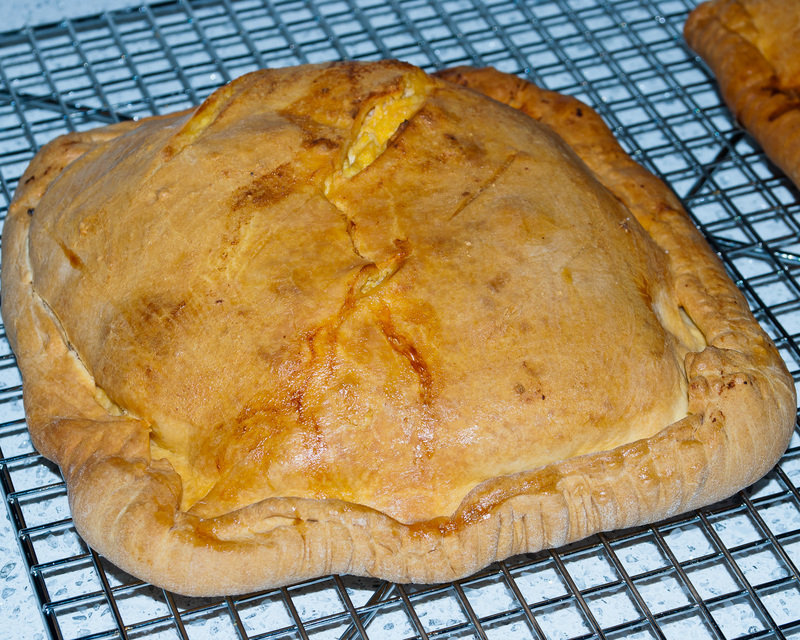 Baste with some egg wash, but do not baste the sealed edges and corners, just the top. At this point you have an option. You can slash it a couple of times across the top, or take a toothpick and poke some holes in the top gently to allow the steam to escape. I did half one way and half the other way to see what was better, I personally like the slash method! Place on parchment paper before setting on the tiles so that you do not burn the bottoms. Place the pies on a wire rack and allow to cool completely. Refrigerate or freeze what you do not eat.